​Body maps are the neural structures used by the brain to sense where everything is in space and then to control movement. This is an important and often unknown concept that has practical value for therapists and trainers working with people to improve movement. Proprioception, body sense or kinesthetic awareness all refer to the brain’s ability to sense the position of different body parts in space. When proprioception is compromised, seemingly simple activities like walking can become almost impossible. Here’s the part many people don’t know: Proprioception depends entirely on the body maps in the brain. Each part of the body has a separate area of the brain dedicated to moving and sensing that part. For example, we have hands and we also have virtual hands in the brain. These are parts of the brain where the neural structures are set up to represent the size, shape and position of the hands—our body maps. The brain even devotes space to representing objects that aren’t part of the body, but we use them almost as if they are. For example, a tennis racquet starts to be represented in the brain of a player, helping the player hit the ball better. Because the brain needs to use the maps to make decisions about how to move, the quality of the map will help determine the quality of the movement. In general, the more detailed the map of a body part, the better the movements. 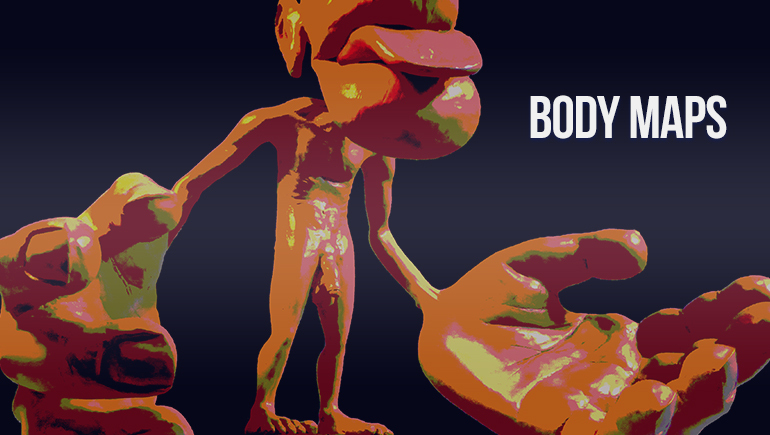 Body parts that have greater movement demands have bigger maps. We can even see this on an MRI. For example, a hand is capable of extremely intricate and differentiated movements and sensations. Consequently, the brain devotes a very large area to sensing and controlling it. These body maps grow larger when placed under demand, which is another indication that good maps are essential for coordination. The part of the musician’s brain that senses and controls the fingers is observably larger than the counterpart of someone who doesn’t use the fingers as much. How do we build the maps and become better able to move as a result? The information necessary to maintain and build the maps is provided by mechanoreception from the body, which happens when we move. In order to make long-term changes in body maps, we need to consistently place demands on them over time. When a certain movement is used repeatedly in a coordinated way, there are physical changes in the part of the brain that controls that movement. Those movement maps degrade in the opposite process. Movement tends to clarify maps, fill them out and give detail. The lack of movement often blurs them. The pelvis and low back is an area where it’s common to have sensory motor amnesia. In people who do a lot of sitting, there’s not a lot of differentiated movement in the low back. The area tends to move as one big block. This is not because the structure doesn’t allow it, but because the movement has been neglected for so long the brain no longer maps it. Pain is another way to lose the quality of your body maps. This has to do with the idea of sensory gating. Sensory gating means the processing and perception of sensory information is reduced by the presence of competing sensory information. Pain can tend to degrade the maps, and that works both ways. Many pain researchers believe inaccuracies in body maps play a role in chronic pain conditions. Oddly—and unknown to many—the health of the brain’s virtual bodies can be just as important as the health of the actual body parts. This is an area ripe for more study if you aren’t aware of body maps and how to help develop them. For more information on body maps, start with Todd’s Body Maps lecture, and for more depth, read his book, Better Movement. You’ll also enjoy two talks by Guido Van Ryssegem: What is Proprioceptive Training? and Movement Variability. Lorimer Moseley’s Pain video will help you understand body maps and pain. Todd Hargrove is both a certified Feldenkrais Method movement instructor and a certified Rolfer, who left his lawyering practice to share his newly discovered knowledge of a path out of back pain. He is the author of Better Movement, and writes regular articles for his blog, as well other media outlets. You’ll find Todd’s articles on his site at bettermovement.org.